As a pediatric dentist, Paul Weiss, DDS is very aware of the importance of oral health and visiting a dentist from a young age, but he also understands the dental phobia or fear that can overcome a child when undergoing a dental procedure. This is where Weiss’ Golden Retriever, Brooke, comes in. Between her deep, gentle eyes, her wagging tail, and her warm, furry coat, she serves as the perfect addition to Weiss’ dental practice. 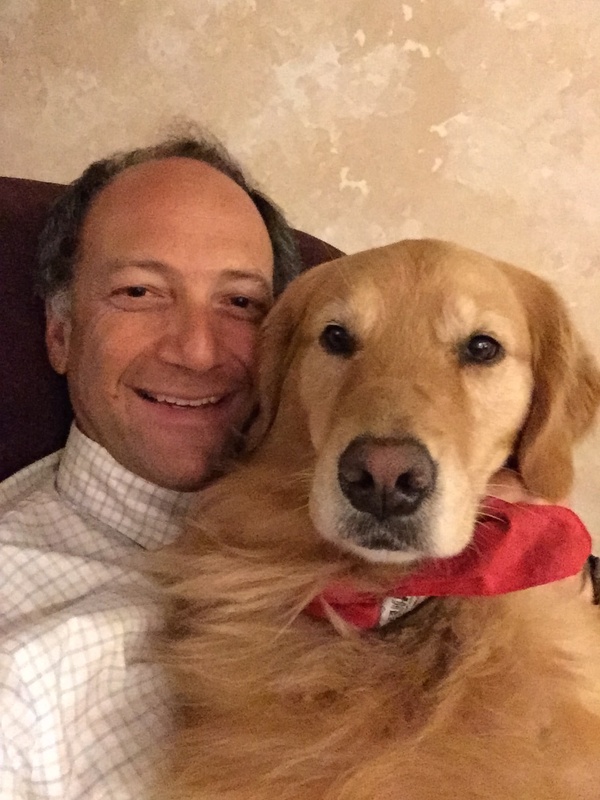 Dr. Paul Weiss and therapy dog BrookeWeiss was born and raised in the Buffalo, New York area and attended SUNY at Buffalo for both his Bachelors and DDS degree. After graduating from dental school in 1987, he went on to complete two more years of training in order to specialize in Pediatric Dentistry. Weiss opened his own practice in Williamsville, New York in 1989 and has been serving infants, children, and teenagers in the greater Buffalo area ever since. About five years ago, Weiss’ teenage son began longing for a dog. After some consideration, Weiss decided that adding a dog to the family would be beneficial to them all. But, their family pet, Brooke, proved to have the ability to impact more than just the Weiss family. He began researching therapy dogs in dental offices and was surprised to find very little information on this matter. Weiss knew, though, that Brooke would be a great fit in his office and decided to move forward with the process. After receiving the okay from the New York State Dental Association and purchasing his own insurance policy to cover the liability of bringing a dog into his building, he began preparing Brooke for her new job. While it was not required that Brooke be certified as a therapy dog in order to work in Weiss’ private practice, he decided to have her go through the certification process with Therapy Dogs International (TDI) to be sure that she could pass the therapy dog test and was ready to take on a role in his office. Because of Brooke’s temperament, she did not require a lot of training in order to prepare for her therapeutic role. As a puppy, Weiss taught her the basic commands such as sit, stay, and down; his only concerns were with her jumping and possibly reacting to the variety of noises that are present in a dental office. To make sure that Brooke was completely ready to work as a therapy dog, Weiss enrolled her in a two-week-long intensive boot camp at K9 Connection in Buffalo, New York. Every day for two weeks, Brooke received professional training that quickly prepared her for the TDI certification test. 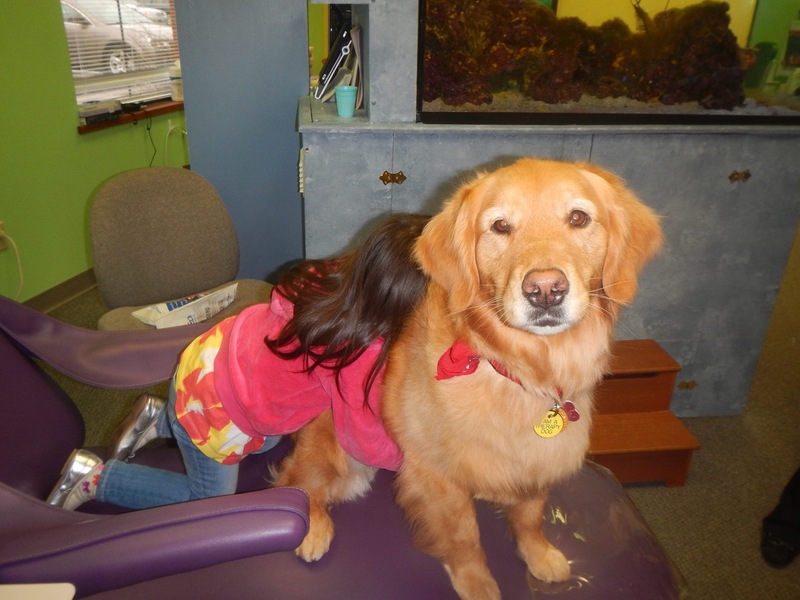 Weiss and Brooke passed the TDI test with flying colors, and the three-year-old Golden Retriever began her role at the dental office in the summer of 2012. She transforms the energy level in the office and makes everyone-patients, parents, staff, and Weiss-feel at ease. During her TDI test, the examiner commented that Brooke seemed to have a special ability to sense and connect with developmentally disabled individuals. Weiss has seen this hold true as she connects especially well with his developmentally disabled patients. For instance, Weiss was able to complete a procedure on one such patient who was anxious and easily stressed out and never would’ve been able to get through the procedure without having Brooke to pet. Weiss has seen parents leave his office in tears because they are so happy that their child actually looks forward to coming to the dentist. While the children often aren’t aware of the significant impact that Brooke is having on them, parents and those around the office recognize her therapeutic and beneficial role. “When her tail wags, everyone’s tail wags,” said Weiss. Weiss is satisfied with the ways that Brooke is being used in his practice right now. Despite indications from patients that it would be a popular move, he does not plan to bring her into the office more frequently because he does not want to stress her out too much and wants to leave plenty of time for patients who do not desire to have Brooke present during their visit. Weiss respects those who are either allergic or afraid of dogs, and these patients are generally scheduled for a day when Brooke is not in the office or, if she is, she is put in a separate room during their appointment. Brooke’s incorporation into Weiss’ practice has proved to be a great success, but he does face the challenge of uneducated people who do not understand her use. He must explain to some people that no one will get sick from her and that she is not delivering any type of bad bacteria that could have adverse effects on patients. Weiss is working to make sure that everyone realizes that dogs are actually quite sanitary and very appropriate in a medical setting. A few years ago Weiss may have been one of the only ones with a dog in his practice, but this is now becoming more common place and widely accepted. After Brooke first started in Weiss’ office, a picture of her with a child during a procedure went viral online, which initiated many stories about her in publications such as the New York State Dental Journal and Huffington Post. 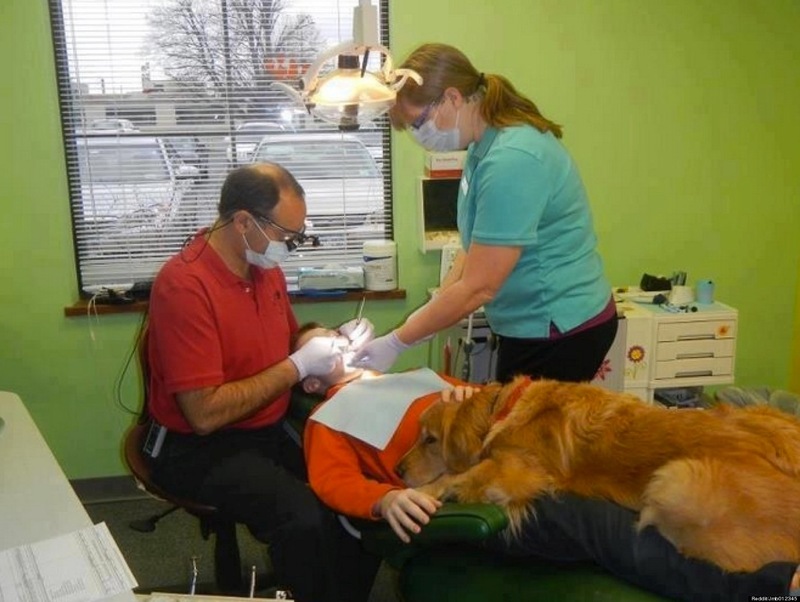 The buzz that she created was very encouraging to Weiss, and he was touched by the public’s acceptance and comments such as “I wish you weren’t just a pediatric dentist so I could visit a dentist with a dog.” Since then, Weiss has received many phone calls from both local and nonlocal people who want information about bringing a dog into a dental office. Weiss is happy to inspire others to make use of a therapy dog. For more information about Paul A. Weiss, DDS and Brooke, visit their website.